Attached events allow attaching a handler for an event that is defined in an element other than the one adding the handler. For example, a StackPanel might define a handler for the Click event that is defined in ButtonBase. 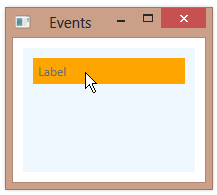 When defining handlers in XAML, the event name is used by itself if that event is defined for the element raising the event. When defining a handler on an element that does not define the handler’s event, you prefix the event name with the name of the class that defines the event. 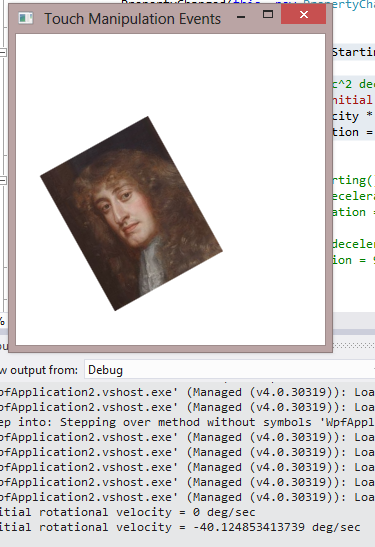 When events are routed in WPF, elements up (bubbling) or down (tunneling) the logical tree are given the chance to add a handler for a particular event. For example, if you have a Button within a StackPanel and the user clicks on the Button, the Button will raise a Click event, but also bubble the event up to the StackPanel so that it can also raise the Click event. Click is defined as a RoutedEventHandler in the ButtonBase class. There is also a public static ClickEvent object of type RoutedEvent defined in ButtonBase. So we think of ButtonBase as “owning” the Click event. This makes sense, since buttons are generally the elements that will raise Click events. The StackPanel does not define a Click event, but can define a handler for a routed event object that it does not own. This is known as an attached event. Events fired from user interface elements in WPF are typically routed events, firing events from elements up or down the logical tree after the source element has fired the event. A user interface element must be both visible (Visibility = Visible) and enabled (IsEnabled = true) in order to fire an event. If an element is not visible or is disabled, the topmost element beneath the element may fire the event instead. 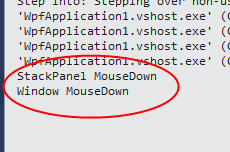 Below, if we set IsEnabled on the Label to false, its MouseDown event will not fire and the StackPanel will become the source of the event instead. When we click on the Label, the StackPanel fires the MouseDown event, followed by the parent Window.